Lawn weeds where do they come from? On the wind, the feet of birds and other animals, from untreated manure or compost dressings, in the topsoil you may have bought – and alas, in the seed you thought was pure grasses. Broadleafed weeds, in general, can be killed with 2,4-D, (I myself prefer Glyphosate – Roundup or Diquat dibromide – Eliminator) which is mentioned under several of the individual headings below of the lawn weeds. Pictures should help you in identifying them. Use 2,4-D or any weed killer for greatest safety on a windless day, and even then cover valuable plants from the drift or fumes. Even with precautions, sensitive plants like grapes, tomatoes or melons a few feet away may be injured. Use 2,4-D when them temperature is above 70, and when plants are growing actively. For hardy things like dandelions and shepherd’s purse, choose a warm day very early orvery late in the year when desirable plants are nearly dormant. Remember that 2,4-D will damage or kill the clover in your lawn,if you have any. Several commercial preparations containing 2,4-D in dry granular form are available, and have the advantage of being more convenient and safe to use than the liquid sprays. These yard weeds are found throughout the country. A perennial, it seems to prefer shaded places. 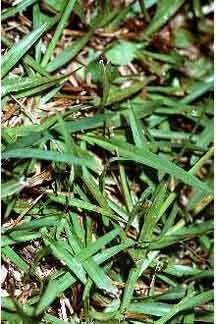 It survives rough traffic, close mowing (its flat leaves lie close to the ground) and if it succeeds in sending up only a few of its wand-like seed stalks, it will spread. It is never a pest in cultivated places, because it doesn’t seed until its second year. If you have only a few scattered plants, dig them out with a knife, sharp hoe or other type of the many hand garden tools. If the whole area is covered with plantain, dig up and replant grass then watch closely for a year or two to remove young seedlings that may come up. Or spray with 2,4-D in early spring or late fall. Some call it pepper grass (mistakenly that name belongs to another weed) and it literally appears everywhere in the spring. Starting from a ragged little rosette that stayed alive all winter, the plant shoots up its wiry flower and seed stalk on the first warm days, and is more of a messenger of spring than the dandelion. Each little “purse” along the stalk contains many seeds just a few in the lawn can be dug or hoed out but if you have many, spray late in the fall or early in spring with 2,4-D. Early and frequent mowing will help to stop its spread of seeds. 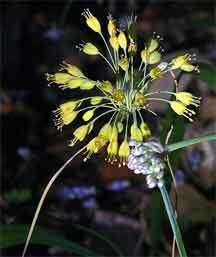 A sprawling, matting weed that seldom gets off the ground, from the genus Axonopus. 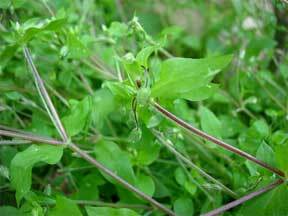 Sometimes it’s confused with chickweed, but it can be easily identified by the way it bears its light green leaves in little whorls at the joints of the stems. Its tiny white flowers come at the nodes, too, starting in June. 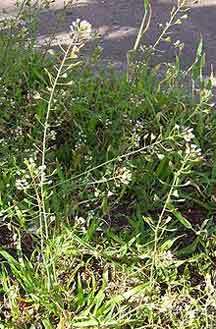 A native of warm climates, the carpet weed begins to grow about the time crab grass does, and comes up each year from seeds. Pull or hoe it out of the lawn; or if it’s too thick, sprinkle or spray it in early June with 2,4-D. Believe it or not, this belongs to the pink family. In early spring it will be showing light yellow·green color before your bluegrass becomes active. 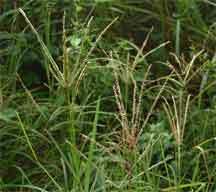 Its little roundish leaves, on many branched stems, form a tangled mass among the leaves of grass. It grows so fast it takes over an area before you know it. And it has bloomed and made seeds almost before you start to mow. An annual, it comes up every year from seeds-usually germinating in the fall and waiting quietly until spring’s early warm days. It can be hoed or pulled out with a rake; or if you have a bad invasion, spray or sprinkle with 2,4-D.
Another remedy is to dust the plants with ammonium sulfate on a dewy morning; this will burn the plants enough to kill them. The grass may be burned, too, but its perennial roots will recover. A plant with a fitting name. Maybe you won’t recognize it when it’s young, but by July when it starts to send up its thin, finger-like seed heads there is no mistake. The plant that started from a single sprout has become a spreading mass, rooted at every joint that touches the ground. Even the closest mowing cannot keep it from seeding, although close and frequent mowing will cut down the amount of seed produced. Crab grass grows only in the sun; hence one of the best ways to discourage it is to keep the lawn grasses growing heavily and cut high. Even this won’t help when the real heat comes. and the lawn grasses go on vacation. That is when crabgrass really takes over. 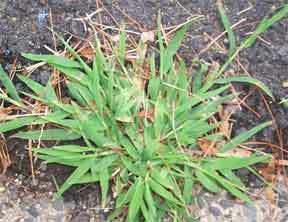 There are three approaches to crabgrass control. The first is manual digging it out by hand, whenever you spot a clump of it in the lawn. This is not hard if you have only a little crab grass. The second is by using chemicals which kill the seeds before they sprout. Preparations containing 2,4-D chemicals are sold for this use. They must be used early in the season. The third is by using chemicals which kill the young plants. Follow herbicide label directions. This is often called and easily confused with another mint, henbit. Other often used names are creeping Charley and ground ivy. This weed is a perennial, and its leaves and stems are smooth. The henbit is an annual and has hairy leaves and stems. Either is a bad pest in a lawn, for they will take root at every joint and spread rampantly. Faithful hand pulling will control Gill-over-the-ground. Or spray in early spring or late fall with 2,4-D. 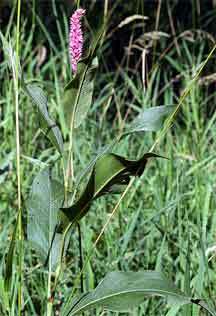 This too is a plantain but its leaves are longer and more pointed than the common plantain, and its seed and flower heads are more club-like. 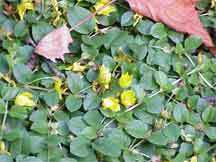 An immigrant from Europe, it is sometimes brought to a lawn in clover seed. It can be eradicated by hoeing out, or if the patch is too thick, by turning it under and keeping the area cultivated until fall when it may be reseeded. 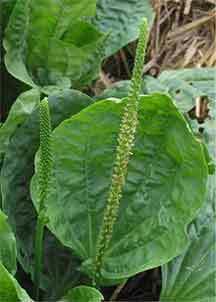 Or spray with 2,4-D as for plantain. Frequent mowing of the lawn, even during the hot weeks when it doesn’t grow fast, will keep this pest from going to seed. Sometimes people call this crab grass or other names (often unprintable). Look for the toughest, darkest grass, growing in the most impossible places – paths and driveways – where even crab grass gives up. It resists the lawn mower, and a good husky plant may make a mat close to 30 inches across and almost impossible to pull up. An annual, it grows throughout the eastern part of the country, west to Nebraska. It seems to prefer places where the ground gets packed hard. Seeds are much larger than those of crab grass, and are formed on blunt, heavy, finger-like stems. To control this grass, first keep it from making seeds by frequent mowing; hoe or pull it out when plants are young. Some of the crab grass killers will get it. Can there be anyone who doesn’t know this weed? Another perennial, the dandelion keeps growing practically the year around in milder climates; it often grows from seed to flower in one season. The best way to control dandelions is to keep the grass flourishing, so the dandelions are crowded out. High mowing – 2 to 2 1/2 inches will also discourage the ground-hugging dandelions. If you have only a few stragglers, dig them with a knife. Be sure you get most of the root or it will soon send up a new top. If you have lots of dandelions, spray your lawn with 2,4-D. Fall is a good time to spray dandelions, after other plants have started to go dormant. 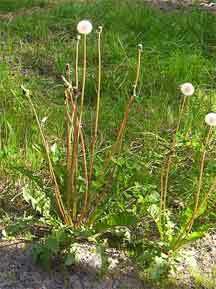 More on How To Get Rid of Dandelions. This is really “not grass” it is of the buckwheat family. You can tell this by looking at it, for it has small, bluish, oval leaves attached to many-jointed, sprawling stems. It likes to grow where the ground is hard… along driveways and paths, or in playgrounds. It is an annual, growing up from seed each year, so the best way to control it is to hoe or dig it out while it is young, in June or July, before it makes seed. Mowing will not keep it from seeding. And after a plant gets full grown it is very difficult to pull. Spraying with 2,4-D will also kill it, if done in the early stages of growth. Sometimes planted as a ground cover in rockeries and shady places, this plant becomes a pest when it escapes into the lawn. 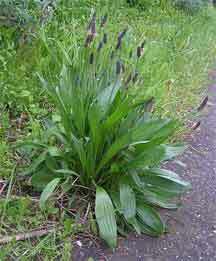 It has round, opposite leaves on long stems that creep along the ground and root every few inches. It bears bright little yellow flowers. Where there’s too much to pull by hand or spray it with 2,4-D.
An immigrant from Europe, this used to be confined to the eastern states but now it’s reached as far west as Kansas and maybe beyond. It grows up in bright little clumps that rise above surrounding grass in the spring. Cut or pinch a blade of it and you’ll notice the onion odor. If you don’t mow it before late May or June you’ll see the little umbels of green or purple flowers, often mixed with tiny bulblets. Dig it out (be sure to get it all). In very early spring you can kill wild garlic with 2,4-D.